Throughout the school the administrative people assigned for facilitating a school event scramble to make parties like the school carnival as safe as possible. This is particularly true with inflatable attractions. It’s extremely important to take the precautions necessary to make sure that everyone has a good time without ending up in a hospital. We’ve compiled a checklist for your party planners to cover when including items like bounce houses. Have you received a signed permission form from the parents? We would suggest that you send out a permission slip prior to the event that includes signatures from any parent or legal guardian to protect your school or organization. In the event that a tragedy happens this can keep some peace of mind. Is there a hand washing station outside of the bounce house or even the water slide? Each one of our inflatables goes through an extensive cleaning process after each use. But the kids need to take extra care here. Offer an alcohol free hand sanitizer before and after the child enters and exits the play area. Don’t assume that they will remember to use the sanitizer. Have an assistant to help administer this safety aid. Although hand sanitizer is not guaranteed to cure any disease, it will help to lower your child’s risk of contracting some illnesses. Do you have more than one attendant on site, including private parties? There should be up to 2 attendants at each bounce house or water slide location. These individuals will assist people getting in and out of the attraction. They can also be on the lookout for fights, injuries and incidents while the children are inside of the inflatable. Is there a first aid kit nearby or on-site? A school nurse is also a smart person to have on board for any event. But in any event there should always be a first aid kit on the premises that is located in a universal area that authorized personnel can find at a given notice. A child can be stung by a bee or someone can twist an ankle and you’ll be prepared at a moment’s notice for any type of danger. Is there an area that the houses can be tethered down properly? Our specialists can assist you and an assessment can be done if you’re in doubt. Most accidents can be prevented. By taking the extra steps to prevent anything from happening your event will move along smoothly and allow more fun to be had by all. 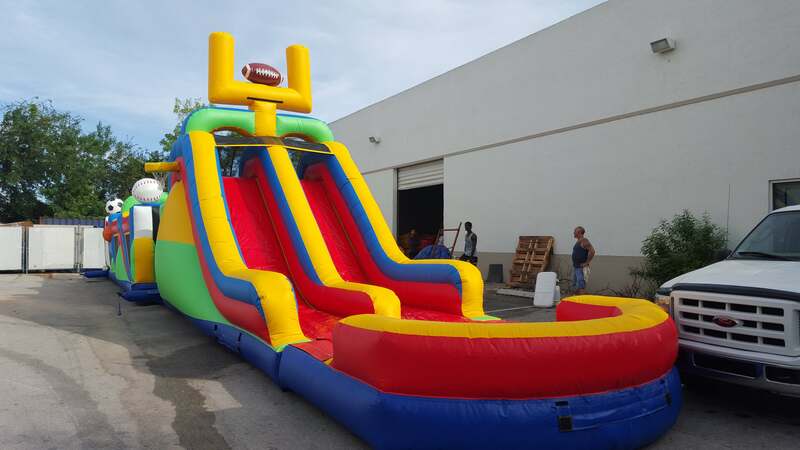 If you are interested in renting party supplies or a bounce house in South Florida, Boynton, Boca Raton or Broward County give us a call now. For more information regarding our Bounce House Rentals for Palm Beach and Broward County School Districts, contact our office.